International Polar Year (March 2007- March 2009) South Georgia and South Sandwich Islands are issuing a series of stamps. South Georgia has been closely linked to polar scientific research from the very first International Polar Commission back in 1879 in the city of Hamburg. Actually the earliest example of international coordination in polar science was the Transit of Venus, 9 December 1874. It was observed in Antarctic regions by Britain, France, Germany and the United States which established eight coordinated observatories. All took a variety of scientists as well as astronomers. Biological, geological and surveying programmes were conducted. The idea was conceived by the Austrian explorer Karl Wlyprecht. The International Polar Commission was formed at a conference in Hamburg 1879 leading to the organisation of the first International Polar Year (IPY) from 1 August 1882 to 31 August 1883. The programme involved 12 countries which established 14 scientific stations in polar regions for coordinated scientific observations. Two stations were established in southern regions; France in Tierra del Fuego and Germany in South Georgia at Moltke Base, Royal Bay. These stations observed the transit of Venus of 6 December 1882. As meteorological and geophysical sciences, research and collections were made in almost every other branch of science in the polar regions. Antarctic research on South Georgia included comprehensive surveys of the botany, with particular studies on the occurrences and distribution of birds and seals. Based on two contemporary sketches, the 50p stamp illustrates the Zoological building at Moltke and studies into the metabolism of King Penguins. Two of the study penguins, nicknamed Melchior and Balthasar after the three kings of the Christmas story, were restrained during the experiment with “ledercorsets”. Kaspar, however, was simply content to keep them company. The proposal for a second IPY (August 1932/August 1933) was formulated by Dr Johannes Georgi of Germany but it was adversely affected by the economic stringency following the financial depression of 1931. Thus no stations were established in Antarctic regions, although several had been planned. Data were contributed by the meteorological observatories on the South Orkney Islands (established 1903) and South Georgia (1905) and about 12 vessels of the Southern Ocean whaling fleet. Discovery II also contributed data while circumnavigating the Antarctic (1931-33). The 60p stamp illustrates the Meteorological station at King Edward Point, South Georgia. The third IPY (International Geophysical Year, 1 July 1957 to 31 December 1958) engaged 66 countries, snowballed into the International Geophysical Year and became a simply stunning year for the scientific community. Researchers discussed the theory of continental drift and plate tectonics; they made the first measurements of the thickness of the Antarctic ice sheet and so were able to estimate how much of the planet’s freshwater is locked up in the ice. Scientists discovered the Van Allen Radiation Belt. The world’s first satellites were launched and the spirit of cooperation led to the ratification of the Antarctic Treaty in 1961 and the first truly international territory. The year saw the start of long-term measurements of atmospheric ozone above Antarctica, which led to the discovery of the ozone hole by British Antarctic Survey scientists in 1985. The contribution from South Georgia was the on-going observations of the Falkland Islands Dependencies Survey. Fifty years on from the International Geophysical Year, technological developments such as earth observation satellites, autonomous vehicles and molecular biology techniques offer enormous opportunities to greatly improve our understanding of polar systems. This IPY (March 2007/09) also provides an exciting opportunity to engage the upcoming generation of young scientists and to further educate the public. 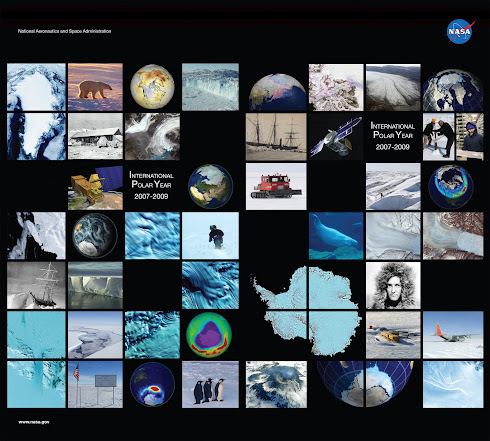 The fourth IPY was launched in March 2007 and has been extended to March 2009 to allow for two field seasons at both poles. Over 200 projects are taking place with thousands of scientists from over 60 nations examining a wide range of physical, biological and social research topics in the Arctic and Antarctic. 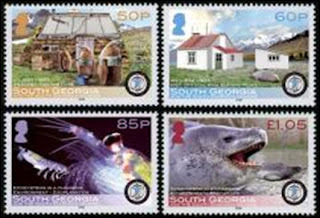 Based on images taken by British Antarctic Survey scientists working around South Georgia, the 85p and £1.05 stamps capture the importance of the marine ecosystem. From the tiny zooplankton such as krill up to the large predators such as leopard seals, the delicate balance of the polar oceans is liable to disturbances from climate change. Many of the IPY projects are focused on understanding how the animals inhabiting the polar regions may be affected by changes in sea temperature and sea ice coverage. ICED (Integrating Climate and Ecosystem Dynamics”) is one of the projects studying these interactions around South Georgia and many other areas in the Southern Ocean. The latest technology has been used to make tiny devices to attach to seabirds and marine mammals, which record information about where they go and what they do. Data collected from ship surveys and moorings provide details on fish, krill and the microscopic plant life. Such information helps scientists to build up a clearer picture of how the ecosystem fits together and what this will mean in the face of a changing climate. Selos / Timbres / Stamps: Four stamps of 50p. 60p, 85p and £ 1.05.